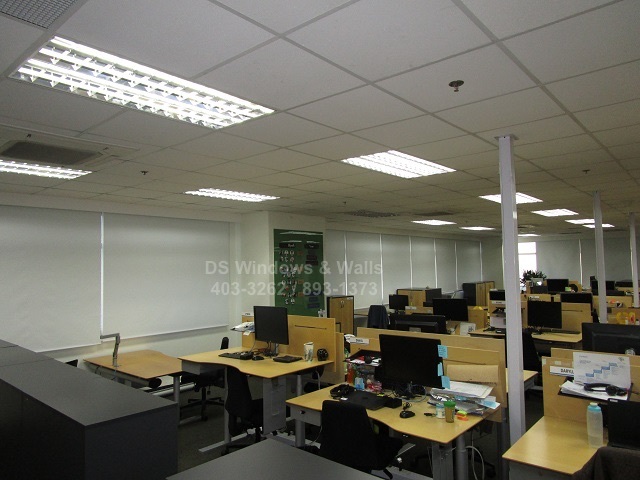 Recently, we were awarded the project for installation of blackout roller blinds in Ortigas, Pasig City of an international company that supplies advance industrial pumps with 83 companies accessible to 56 countries so it’s a pretty big company. 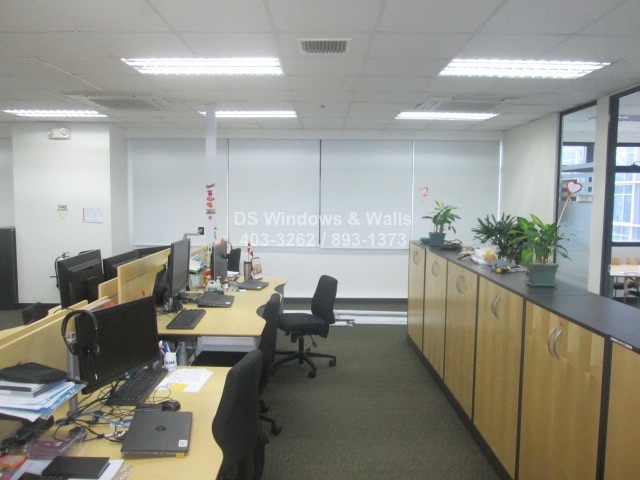 Before contacting us for their window covering needs, they already have a sunscreen roller blinds installed. 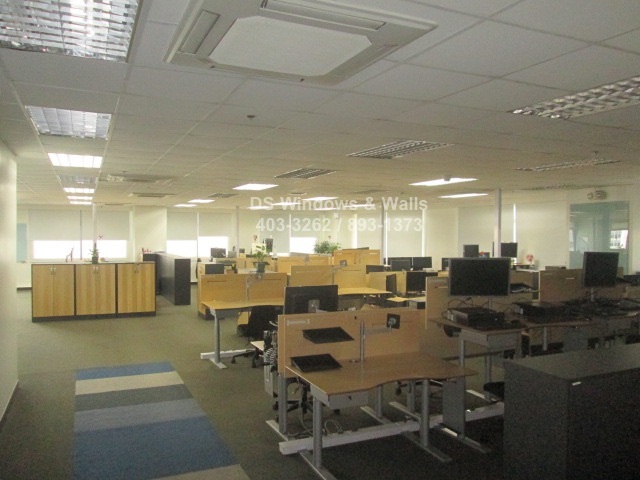 The problem is that the heat and light is still penetrating their office workplace since the existing fabric has 5% openness factor and so they decided to look for suppliers that can help solve their dilemma. Normally, this kind of setup requires double mechanism that supports two fabrics at the same time i.e. blackout at the back and sunscreen in the front. However, since they already have existing roller shade sunscreen we had to insert a blackout roller shades in the ceiling in between the existing blinds and the window panels. Luckily there is enough spacing in the ceiling to permit this setup. The photo above is the manager’s area and before the blackout fabric installation, the light and heat traverse the fabric that creates distraction and discomfort to her work desk. The best solution is to combine both sunscreen and blackout fabric so that end users can control light and heat better. During rainy season or late afternoon one can simply open the blackout fabric to permit maximum natural light. On the other hand employees can also pull the blackout fabric down when there is too much light and heat especially during noon time. We cannot stress enough the importance of a proper window covering especially in a workplace where productivity of all employees are expected. With proper lighting, temperature, and sound level, employee productivity can go up and one aspect that can help this is roller shades. If you have the budget, installing both sunscreen and blackout fabrics is the best as it permits maximum light and heat control. 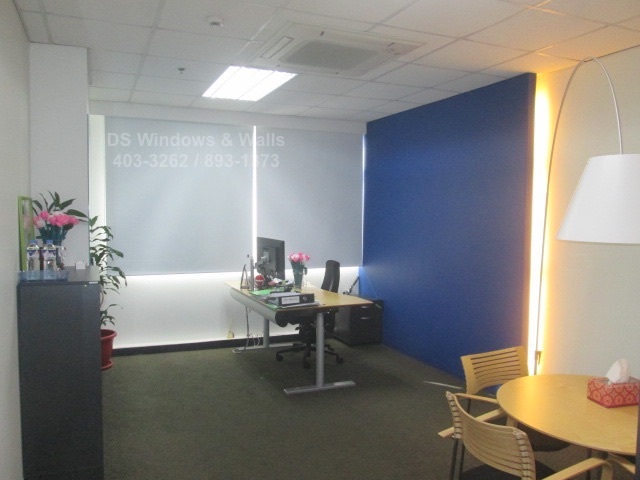 For inquiries about our roller shades and available fabrics please call us at (02) 403-3262, (02) 893-1373, (02) 668-9668 or 0916-311-3909 or visit our sales mall branch near you.